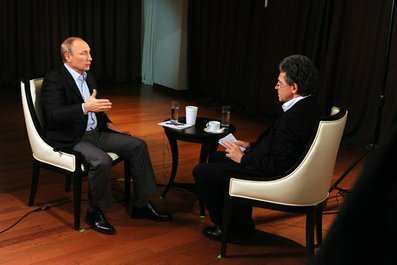 President of the Russian Federation Vladimir Putin answered questions from Hubert Seipel of the German TV channel ARD. The interview was recorded on November 13 in Vladivostok. There are many other things that may not be clear for people who are not informed regarding these matters, but they do exist. For example, there are technical regulations that are different in Russia and in the EU, we have different standards. Those are standards of technical control, phytosanitary standards and the principle of determining the origin of goods. By way of an example I would cite the component assembly of cars in Ukrainian territory. According to the Association Agreement, the goods manufactured in the territory of Ukraine are intended for our market within the framework of the Russian-Ukrainian free trade zone. Your companies that invested billions of euros in factories in Russia (Volkswagen, BMW, Peugeot, Citroen, the US Ford, and others) entered our market on completely different terms, on condition of deep localisation of production. How could we accept that? So we said from the outset, "We agree, but let us proceed step by step and take into consideration the real problems that can emerge between Russia and Ukraine." What were we told in response? "It is none of your business, so get your nose out of these affairs." What are those problems? Indeed, self-defence fighters, for example, were supposed to leave some of the towns they had surrounded, are yet they haven’t left. Do you know why not? I will tell you plainly, this is no secret: because the people fighting against the Ukrainian army say, "These are our villages, we come from there. Our families and our loved ones live there. If we leave, nationalist battalions will come and kill everyone. We will not leave, you can kill us yourselves." You know, it is a difficult problem. Of course, we try to convince them, we talk, but when they say things like that, you know, there is not much that can be said in response. What is the essence? The coup took place in Kiev. A considerable part of the country supported it, and they were happy partly because they believed that after the signing of, say, the Association Agreement there will be open borders, job opportunities, the right to work in the European Union, including in Germany. They thought that it will be like that. In fact, they have nothing of the sort. The other part of the country, the southeast, did not support it and said, "We do not recognise you." And instead of starting a dialogue, instead of explaining to people that the central authorities in Kiev are not going to do anything bad, and on the contrary, they will propose various forms of coexistence and development of a common state, they are ready to grant them their rights, instead of that they begin making arrests at night. Once the night arrests began, people in the southeast took up arms. Once they took up arms, instead of stopping (the authorities should have the wisdom to do that) and starting this dialogue they sent the army, the air force, tanks and multiple rocket launchers. Is this a way to solve problems? And ultimately everything came to a deadlock. Is it possible to get out of it? I am sure that it is possible. As for the security issues, I would say that in this area our viewpoints and approaches do not always coincide. What is clear is that Russia and the Federal Republic of Germany want the situation in this region to be settled. We are interested in this and we will work for the observation of the Minsk agreements. There is just one thing that I always pay attention to. We are told again and again: pro-Russian separatists must do this and this, you must influence them in this way, you must act in that way. I have always asked them: "What have you done to influence your clients in Kiev? What have you done? Or do you only support Russophobic sentiments?" This is very dangerous, by the way. A catastrophe will happen if somebody surreptitiously supports Russophobia in Ukraine. It will be a real catastrophe! Or shall we seek a joint solution? If so, let's bring the positions of the parties closer together. I am going to say something that some people in this country may not like. Let's try to achieve a single political space in those territories. We are ready to move in this direction, but only together.